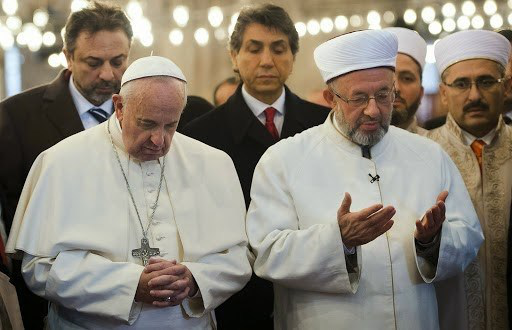 admin The Fight for the Faith April 12, 2014 Ecumenism, Islam, Pope Francis, The (so-called) "Orthodox"
During his recent trip to Turkey, in the blue Mosque of Istanbul, Francis took off his shoes, and had the Great Mufti read and explain the Koran to him. Then, at the suggestion of Françis, the two together, turning towards Mecca, prayed ostensibly for a long while. “The faith that your parents inculcated in you will always help you to advance.” (In an address to the Muslim immigrants in a parish in Rome: romereports; laportelatine). “Finally, I send you my prayerful wish that your lives will glorify the Most High and produce joy around you. Happy Feast Day to you all!” (Greetings destined for the Muslim Community at the end of Ramadan: Vatican site – Islam and truth). “I desire to turn my thoughts towards the dear Muslim immigrants who begin tonight the fast of Ramadan, wishing them abundant spiritual fruit.” (Taken from the French paper: La Croix). “It’s admirable to see that the young and old, men and women of Islam, are capable of consecrating time each day to prayer, and to the faithful practice of their religious rites.” (Evangelii Gaudium, Paragraph 252: Vatican site). “Then, as he was finishing up his speech, Pope Francis made an unexpected gesture. 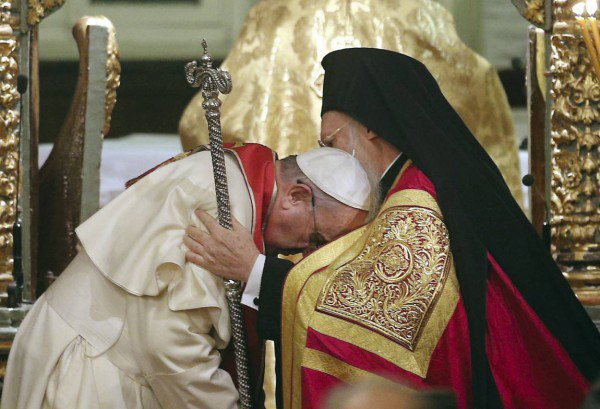 He thus asked a ‘favor‘ of the Orthodox Patriarch: ‘Bless me and bless the Church of Rome‘. 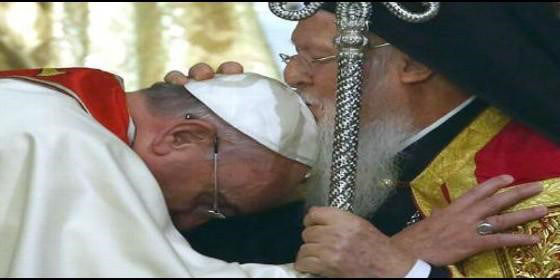 The Patriarch hesitated a moment before the Pope who lowered his head; he then embraced him.” (cf. lesuisseromain). “I believe that, along with the Orthodox, we’re on the path. They have the Sacraments, they have the apostolic succession… we are on the path. What must we wait for? That the theologians be in agreement? That day will never come, I assure you, I’m doubtful. The theologians work well, but I recall what was said regarding what Athenagoras said to Paul VI: “Let us advance alone; and let’s put all the theologians on an island, that they may reflect!” […] One cannot wait: unity is a path, a path which one must take, which one must take together. And that’s what spiritual ecumenism is: to pray together, to work together; there are many works of charity, much work… Let us teach together… Let us go forward together. It is spiritual ecumenism […] I will say something which maybe not everyone will understand, but… The Eastern Catholic Churches have the right to exist, that’s true. But “uniate” [the term designating the former “orthodox” Christians who have reunited with the Roman Catholic Church, while still keeping their liturgical traditions] is a word of another time. We cannot speak like that today. We must find another way.” (cf. Vatican site; at novusordowatch: blue mosque: Francis and the Muslims: Francis and Ramadan). It wasn’t the first time that he put into practice the false ecumenical principals of Vatican II, according to which the heretical and schismatic sects belong to the one true Church founded by Jesus Christ, a title which since then would be refused to the Catholic Church. (cf. Vatican site). 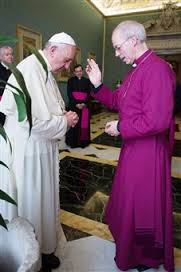 Francis having himself blessed by the “Archbishop” of Canterbury Justin Welby on June 16, 2014, on the occasion of the latter’s visit to the Vatican, accompanied by two ordained women “priests” of the heretical Anglican sect. (cf. pagina-catolica). 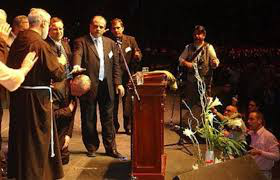 Cardinal Bergoglio receiving the “blessing” of evangelical pastors in the Luna Park stadium in Buenos Aires on June 19, 2006: “While all were praying, the first reflex that I had was to kneel down, a very Catholic gesture, to receive the prayer and benediction of the seven thousand people who were there.” (On Heaven and Earth, dialogue with the Rabbi Abraham Skorka, ch. 28, pg. 3). (cf. calameo; tradiciondigital). And let us not forget the two speeches he gave some days beforehand in Strasbourg, at the European Parliament and at the Counsel of Europe: 7138 words, among which the most used were the very secular, Masonic and naturalistic: “rights of man”, “democracy”, “dignity of the human person”, “peace”, “conscience”, and “dialogue”, but not even once did he deign to pronounce the name of our sweet and adorable Lord and Savior Jesus Christ… (cf. lavie; eglise.catolique). 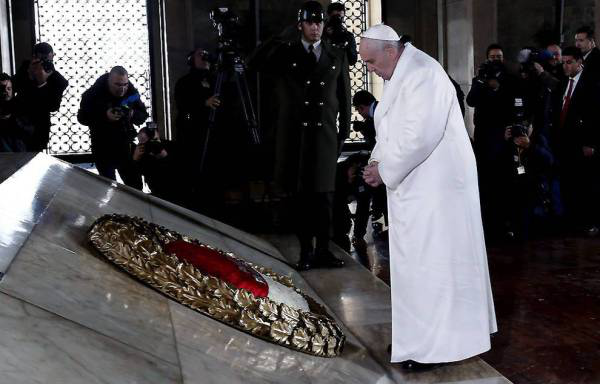 Pope Francis rendered homage to the secular revolutionary Freemason Mustafa Kemal Ataturk, guilty of the genocide of the Armenian people.